The team at Baldasso Cortese are excited to share with you our recently completed project, Mary's Chapel. 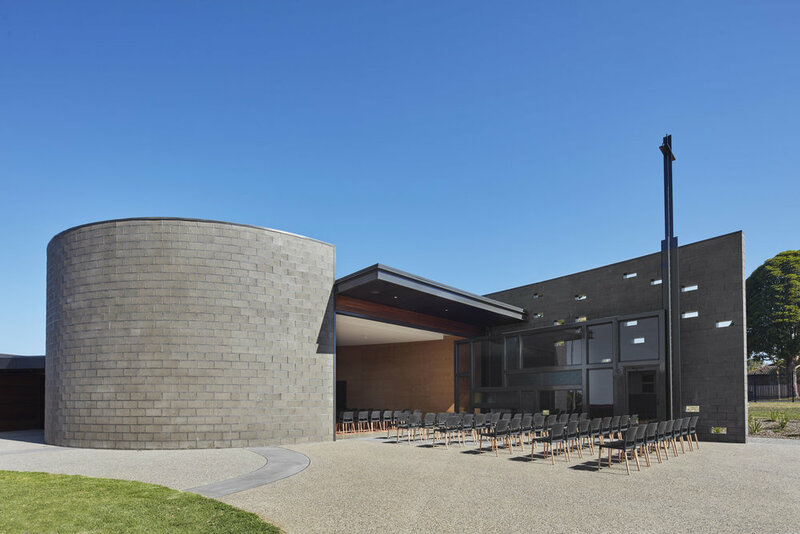 Located on the campus of St Joseph’s College, the new private Mary’s Chapel building has been designed with a clear and strong architectural idea formed around the interlinking circular buildings. The Chapel is strategically located to face the entry to the school and provide a symbolic sheltering of the students and school beyond. As part of the Edmund Rice Education Australia group, the Chapel will provide a space for liturgical learning, mass services and multi-purpose uses such as an assembly hall for the school. Seating 140 people, an enormous pivot hinged steel and glass 7.5m wide door opens up to external areas which allows for the expansion of seating to 240 on tiered seating. The carpet was designed in Geelong and represents the four touchstones of a Catholic School in the Edmund Rice Tradition.